Contrary to what we were told at Mt. Goliath a few weeks ago, the St Mary’s Bristlecones are battered but not quite defeated. You can clearly see, though, that they’ve had a rough winter. From what I can see, I’d estimate a 25-30% die off. You see the dead ones immediately as you arrive at the lake. But if you go to the west side of the St Mary’s Lake, there are live and so far, thriving Bristlecones, and above the cirque a few more. One more warm winter could place the remaining forest in danger. Just finishing off my Black and White activities of the past weekend. Saturday we were at the airport. Last Sunday as the weather appeared to clear we hit the road for Pawnee Buttes inspired by our friends at Colorado Lifestyles. 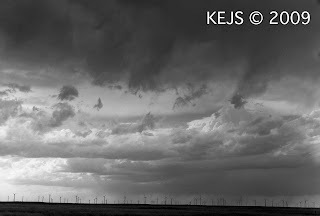 But I found the storm clouds and wind farm in the distance much more interesting than the Buttes. 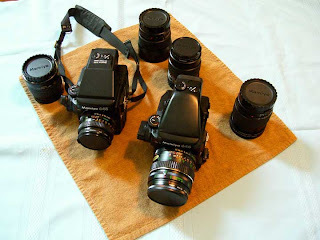 I came across an interesting musing on one of the blogs that I follow regarding buying and enjoying that old manual camera. Since yesterday's discussion focussed on manual cameras and Black and White, I have decided to share that other link with you, from the Visual Science Lab. Over the past year since losing my darkroom, I’ve been shooting about 60:40 color vs. B&W film. 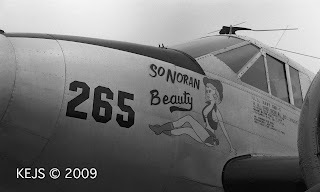 This past weekend I “rediscovered” My B&W self at the Boulder Airport Open House, shooting vintage aircraft with my favorite vintage camera, my Minolta SRT-202 and that workhorse of a lens my 28-200mm zoom. The Annual Air Show had been canceled due to air traffic control interference with DIA, but the Boulder Airport decided to have an Open House and invite vintage airplane owners to show off their prized possessions. Obviously since you can easily develop the film yourself, B&W is the way to go for most film experimenters. It is also the medium of all the old classics. So a few tips that I can pass on: never shoot Black and White in auto mode. I avoid this temptation by using a fully manual camera for my 35mm Black and White. You will also need to become familiar with the “Zone System” (which I would never presume to be able to explain to anyone). As a rule of thumb you can always over expose by 1-stop, and also as a standard practice, bracket your exposures when possible. When you are shooting action, e.g. 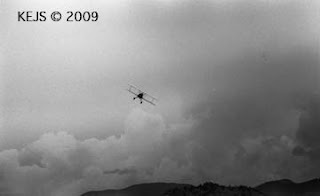 flying planes, you cannot bracket, so you will have to rely on your experience (or luck) to make the best exposure choice. 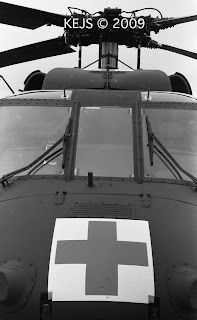 Black Hawk Helicopters are not vintage, but I liked this photo. I normally don't post twice in a day (I'd run out of ideas too fast). But the end of Kodachrome deserves to be noted here. Kodachrome for me is soooo 60's. It evokes memories of my childhood cross country family vacations, dutifully recorded by my mom in Kodachrome slides. I have most of my mother's slides, but sorting through them on such short notice to find an adequate representative (mom + instamatic cameras = not the greatest photography), but in the coming weeks I'll try to find some hidden gem in all those memories. So for now let's remember the famous "Afghan Girl", immortalized by Steve McCurry with Kodachrome film. Although, even he acknowledges that in his search for the grown-up Sharbat Gula, he re-created the image using Kodak E100VS. But I never liked Kodachrome until I saw my father-in-law's slides of post war Japan (early 1950's), all in Kodachrome. Absolutely beautiful! Kodachrome was always favored by professionals, but had such a complex processing method (K-14) that it could only be done by Kodak. Thus the Ektachrome family of films (E-6 processing), which could be processed by local photo labs, gradually became the transparency film standard. I will even be trying E-6 processing myself later this summer. Let's be honest, the films that survive will be the ones that we can process ourselves (or are cheap enough for others to continue to do). I love Daguerrotypes too, but the processing is so toxic that I can do without trying it. The Best Flash for $14.99 That You'll Ever Buy! Incredible? No, just Holga. Although I have never used a Flash with my Holgas, I did buy a Holga Flash unit to use for a class I was taking. I didn't want to invest much, when overall I never use a Flash (only natural light). The class project was to take what I call "Ghost Images". The Technique: a totally darkened room or outdoors at night. Set your camera up on a tripod, and using a cable release lock the shutter open (Bulb setting). Then move the flash (and yourself or your subject) around within the camera field of view. 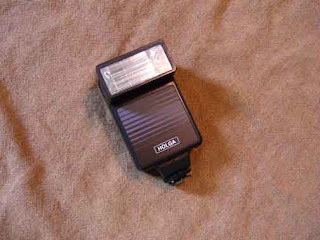 Once in position, set off the flash to make a new exposure. Here is an example taken in a stairway in my old home. If you want to experiment with flash without spending lots of money try a Holga Flash. Also, our class instructor Donald Anderson, recommended the Holga Flash for just that reason. I checked the price and incredibly it is still $14.99. It worked great, and has a better recycle time than you'd ever expect. Available from my friends at Freestyle Photo Supplies. There is now also a Holgon MF Flash for $54.99, but you really don't need that! If You just want to experiment a little with flash, stick with the cheap one! Happy Father's Day to All! 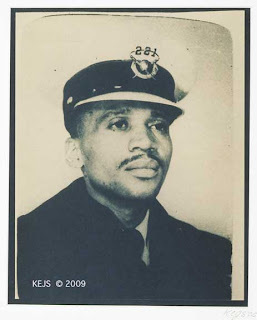 Another photo of my Father, from my Family Tree Series. Dad was Policeman back in the 1950's in Cincinnati. But when they started putting "cops in cars" he and his partner (later my God Father) were both very tall and very uncomfortable in those cars. So they both quit and went on to other things. As with parents and children everywhere, we had ups and downs. But I can look back on my early childhood as a great time of discovery and bonding with my Dad. I believe in preserving the memories of the best of a relationship, even if it turned a little off later on. Unfortunately we can't all feel that way. Let's try to be positive and not be like this man in England. You know it just doesn't serve anyone to hang on to this type of baggage. I began the Family Tree Series as part of a Alternative Processes Class taught by Don Anderson at Monterey Peninsula College, California. This is a Cyanotype as was my Memorial Day posting. At some point I will talk a bit about alternative processes, and making those big negatives for contact printing. Seattle Film Works ENC-II was my first transparency film. I used it from 1983-1998. 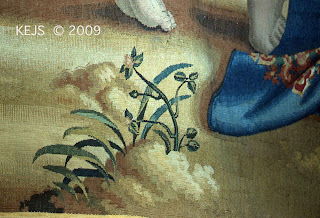 One of my earliest images from 1983 (Left) showing a detail from a medieval tapestry in Seville, Spain. An interior shot with natural light. Recently I’ve found a lot of chatter on-line regarding this film. First, what is SFW-LX, a.k.a. ENC-II film? It is a motion picture film that was marketed for use in 35mm format. It requires ENC-II processing rather than the more familiar C-41 or E-6. It yields both a positive (slides) and a negative (for prints). In the early days SFW promoted push processing of this ISO 100 film up to ISO 400, and later came out with an ISO 800 version that was truly horrible! The film was ideally exposed at ISO 100 or 200. ISO 400 sometimes worked for interiors with lots of natural light. It was not color balanced for tungsten, so you needed a filter for interior lighting. 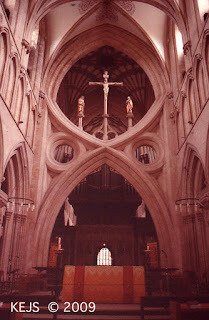 Another interior shot ISO 400 from Wells Cathedral 1990. It shows some of the color balance problems encountered when the film is pushed. 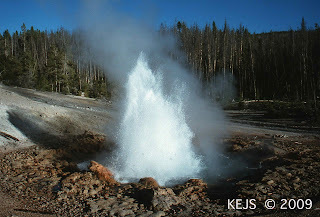 When I first got started in photography, my purpose was to document geological field studies. Having slides and prints was a plus in the pre-PowerPoint days; slides for presentations and prints for proofing, also negatives as a back–up storage format. I found that in the early days the processing at SFW was better than the later years. They eventually started processing the film C-41, which is do-able, but not preferred. In the late 90’s I made the switch to Kodak professional transparency films and never looked back. PhotoWorks (formerly SFW) is now owned by American Greetings (yes the greetings card people) and that means they no longer process film at all. There is apparently still some SFW-XL still floating around out there. Some exposed and some not. If stored fortuitously it may still be good, especially if you found it in a freezer or refrigerator. I say develop it! The web consensus seems to be contact Dale Laboratories if you still need to process this film. My 1998 Southern Africa Portfolio (if I ever get it scanned and posted on my website) represents my last major project with this film. Digital Image Storage Problems: Does Data Rot? David Pogue of the New York Times poses this question in light of the constant changes in data storage technology, and questions regarding storage longevity. Do you know what we really need? A process that transfers digital image files to analog film. I spend all of this time scanning my film, when the film will be readable long after the scanned technology has been discarded. Read David pogue's article and decide for yourselves.... "Should You Worry About Data Rot?". 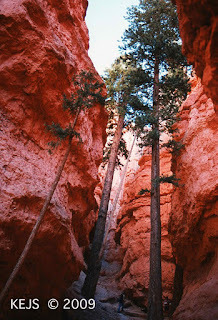 Fuji Superia 400, an inexpensive way to experiment with color film. THE FILM: Fuji Superia 400 (also available in ISO 200, 800, and 1600, but I haven’t tried these). I love the richness of the colors and natural color balance. Fuji print films have always highlighted greens and blues. Perhaps not so great on reds and orange. These rocks actually have a reddish stain. I have not corrected the color balance because I want you to see it as it is without Photoshop enhancements. This film was recommended by Ken Rockwell's photography blog. As I was doing more research on the film for this posting, I came across some postings on Flickr’s “I Shoot Film” user’s forum. I found out much to my chagrin, that Costco had discontinued distribution. But WALMART to the rescue? They have an ongoing distribution deal with Fuji so you can buy and process through them. Some Walmarts are also maintaining their 1-Hour C-41 processing service. If you find dealing with Walmart just too much slumming, you can always rely upon my favorite suppliers (links to the left). I volunteer at a local state park, Eldorado Canyon, near Boulder, Colorado. I always carry a camera, because the moods of the place are constantly changing with the seasons and the daily weather. 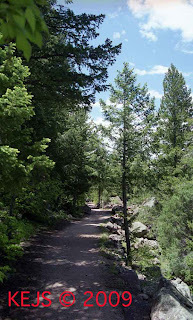 Volunteers hike the trails daily to check trail conditions and keep an eye on the behavior of visitors. The other day I had to remove a park guest from a tree to inform him that rock climbing was allowed, but not trees! We also monitor the climbers and wildlife. 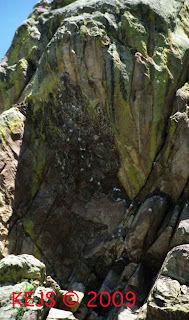 It is a nesting site for the Prairie Falcon and Peregrine Falcon. We also have foxes, bears, rattlesnakes and lots of trout in South Boulder Creek. Also it is a world renowned rock climbing site. I finally realized that I will need to carry my 500mm mirror lens to capture the climbing, my 28-200mm zoom doesn’t get close enough. I will have those photos soon in another posting. And Camera SRT-202….OOPS I don’t have a photo of it yet………. This is currently the only color print film that I shoot. However, I will soon be trying the new Kodak Ektar ISO 100 professional print film. 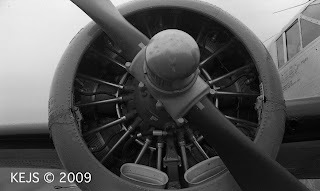 I’ll re-shoot some of the Eldorado sites and do a side by side comparison. 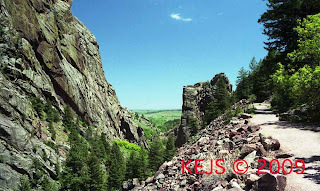 For some side by side print film comparisons go to this recent entry at I SHOOT FILM also. I still prefer my Kodak GX100 transparency film though. 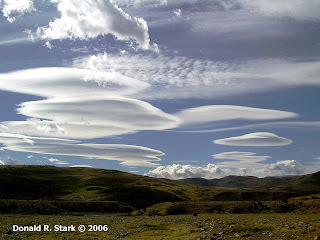 Here is a similar scene taken with GX100. You can see the red color in the rocks, and actually a bluer sky. 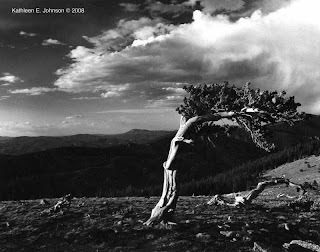 Rocky Mountain Bristlecone Pines.........Going, Going, Gone? Last weekend we made our first trip up Mt Evans, one of the best places to photograph the Rocky Mountain Bristlecone Pine. 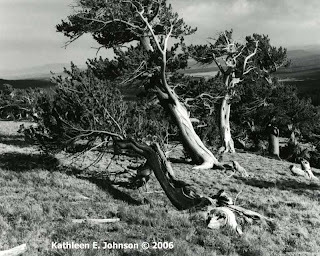 This particular pine is one of the Icons of the Mt Evans/Mt Goliath Forest. Now, however, the Pine Beetle is threatening to wipe out the entire Front Range Population. We were told at the Mt Goliath Visitor's Center that one population in the Front Range, at St Marys, had already fallen victim to the beetle. Some of the tress at Mt Goliath weren't looking too good either. Bristlecones thrive on harsh weather. In fact the Rocky Mountain variety only lives about half as long as the White Mountain population because the climate here isn't harsh enough! Milder climate equals faster growth, equals shorter lifespan. This winter was really mild, keeping the beetle alive, and making the Bristlecones more susceptible. Another victim, perhaps, of Global Climate Change? I call these the 'Three Sisters". They are not located at Mt Goliath, but at a location I will not disclose for their own protection. 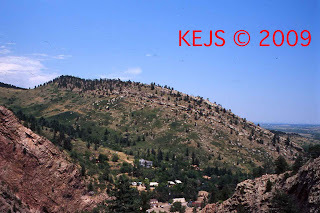 Unfortunately there are a lot of disrespectful people who vandalize these trees and other types of natural and historic sites in the mountains. Film: Ilford ISO 400, my favorite B&W film. Available from my B&W film and darkroom supplier Freestyle Photo. 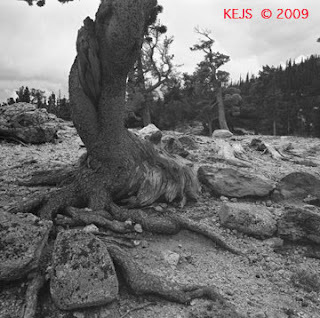 These Ancient Forest Portraits were taken with my Mamiya 645 Pro TL (shown right, with Don's Mamiya Pro on left), with a 45mm Mamiya Secor C f2.8 wide angle lens. 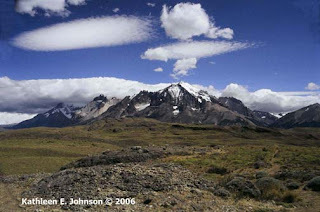 In January 2005 we fulfilled one of Donald's travel adventure dreams by trekking the Paine Massif in Chilean Patagonia. To document our trip we pre-tested several Kodak transparency films: E100G, E100GX, and E100VS. We settled upon Kodak E100GX as our primary travel film. E100GX has a naturally warmer color balance; E100G is too cold for my tastes; E100VS (vivid saturation) will brighten already bright reds and blues (see example at the end). 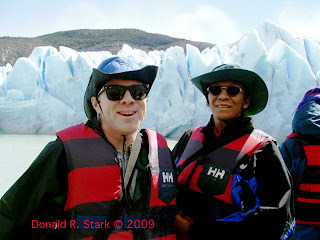 Here are two of Our Favorites, with more available for viewing at Patagonia Calendar. A wide angle view of the Paine Massif, taken with my Minolta X-700 in manual mode (shutter speed priority); using a Tamron f3.8 28-200mm zoom. This is my favorite travel/hiking lens. 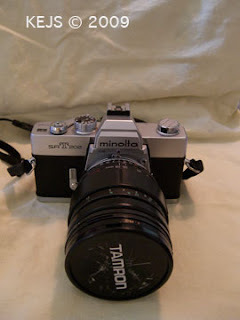 My back-up camera for the trip was my ever reliable Minolta SRT-202, but I didn't need it. Film: Kodak E100GX. exposed at ISO 125 following the guidelines of Galen Rowell. I highly recommend his book: Galen Rowell's Inner Game of Outdoor Photography, for the Adventure travel photographer. Donald's contribution taken with his Olympus OM-1, which is a manual camera; using a Tokina f3.5 28-200mm zoom with macro option. His back-up camera for the trip was an Olympus Camedia D-520 zoom digital camera (2 megapixels). Film: Kodak E100GX, also exposed at ISO 125. All of these Kodak Transparency Films are still available. However, due to some bulk purchasing requirements imposed by Kodak, you cannot buy E100GX at your local photo supplier. I can recommend two options: B&H Photo and Adorama, both listed in my Links. I have had trouble free experiences with both of these companies for both film and equipment purchases. Now for a taste of E100VS. 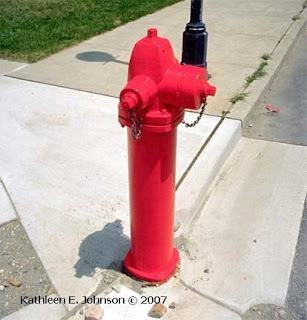 This red is just a bit bluer than the original fire hydrant. And it does get your attention. E100VS is more readily available than E100GX. So you can check your local store first. Making Film and Digital Look the Same? Let’s not, but say we did…….. I was surprised because he really IS the ultimate Digital GURU. But when I searched some of his previous tech tips I found similar entries. I have heard him lecture three times now and I always learn something new. If you ever have a chance to hear/see him in person take advantage of the opportunity. As the article (and his lectures) show he is not a film hater. George Lepp Photography now the Light Photographic Workshops. My Only wish for the magazine Outdoor Photographer is that they stop trying to make digital look like film. Every issue has at least one article on the subject. The fact is that they LOOK DIFFERENT. Just let it be and let them BE DIFFERENT! One major difference is how digital sensors handle depth of field. You simply have more control of the depth of field using film, because digital sensors tend to try to pull everything into focus whether you want it that way or not. There are times when this will be a good thing, and times when it will be a bad thing. Also, please stop trying to sell the idea that anything digital will ever look like a silver print! You may fool yourself until you see them side by side. Now which you actually prefer is up to you, but stop imitating! I know it is the sincerest form of flattery, but it just ain’t workin’ for me!